Stripes! We see them in nature and we've been using them in fashion for nearly forever. From subtle to bold, stripes are a playful way to put a timeless yet modern spin on your wedding look. Bold stripes especially, have a profound way of grabbing our attention. As in today's "Color Monday" inspiration, our eyes cannot help but be drawn to the bold black and white--the perfect backdrop for the gold and pops of preppy green. Love the look of bold stripes? We do too! We also love the idea of pairing minimal décor with them, too. Notice how easily your eyes are able to rest in between the stripes and solid blocks of color ... i.e. the cake, wedding party attire, and the gold scalloped framing of names on the striped wedding invitation. Are you a fan? 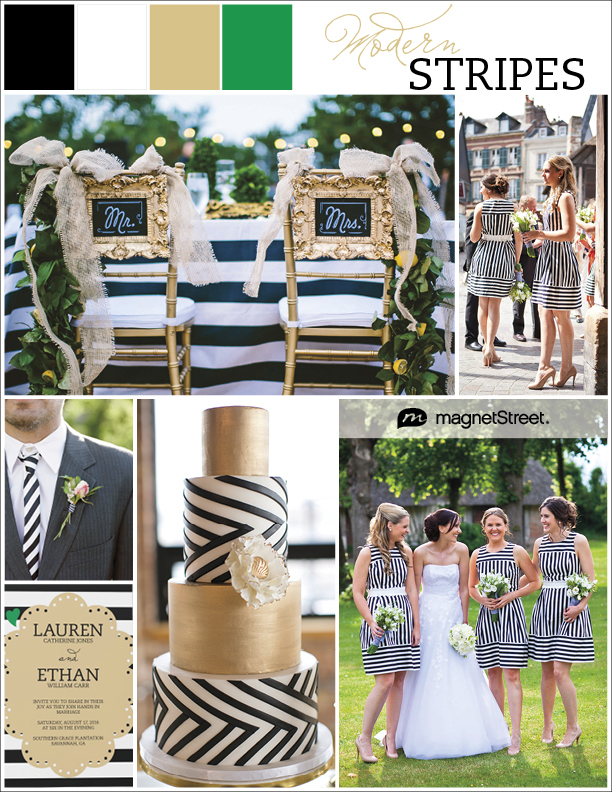 What do you think of using stripes as a wedding pattern? Whimsical charm meets a contemporary look with this design suite that features quirky hearts adorning scalloped framing. The modern stripes and enlarged typography make a bold statement with energy and contrast. Want to see it in person? 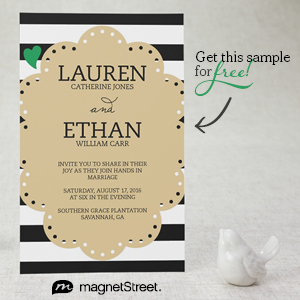 Request a Free Sample … in your wedding colors! Submitted 3 years 7 months ago by Heidi.